Should I refinance my mortgage? How much do I need to save for my child's college education? As accounting professionals, these are some of the questions that are posed to us on a daily basis. We are providing these interactive financial calculators and other tools to assist you with some of the day-to-day questions and concerns that may arise. While these financial tools are not a substitute for financial advice from a qualified professional, they can be used as a starting point in the decision-making process. 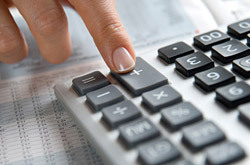 Self-Employment Tax Calculator If you are self-employed, operate a farm or are a church employee use this calculator to determine your self-employment taxes for tax year 2016.